Born in Castle Rock, Colorado, McCaffrey is the son of former Stanford and NFL wide receiver Ed McCaffrey and former Stanford soccer star Lisa McCaffrey. He attended Valor Christian High School in Highlands Ranch, Colorado. He played running back, wide receiver, cornerback, and punter. He broke numerous Colorado high school records including career total touchdowns (141), career all purpose yards (8,845), career touchdown receptions (47), and single season all-purpose yards (3,032). He was the Gatorade Football Player of the Year for Colorado in both 2012 and 2013. He also played basketball. McCaffrey was also a standout sprinter on the track & field team. As a sophomore, he placed second in the 100-meter dash at the Mountain Vista Boulder Invitational with a career-best time of 10.75 seconds. As a junior in 2013, he finished sixth in the 100-meter dash (10.89s) and ninth in the 200-meter dash (22.17s) at the CHSAA State Meet. Considered one of the best one hundred football players in his national high school class, he was selected as a 2014 U.S. Army All-American. He was rated by Rivals.com as a four-star recruit and was ranked as the third best all-purpose back in his class and 77th best player overall. He committed to Stanford University to play college football. McCaffrey played in all 13 games as a true freshman at Stanford, in 2014. In his collegiate debut, he had a 52-yard receiving touchdown against UC Davis. He finished the year with 300 rushing yards on 43 carries and 251 receiving yards on 17 receptions with two total touchdowns. McCaffrey had a breakout sophomore season in 2015. He broke Barry Sanders's NCAA record of 3,250 all-purpose yards, finishing with 3,864. Sanders's son Barry J. Sanders coincidentally happened to be one of McCaffrey's teammates that year. McCaffrey ranked second in the nation with 2,019 rushing yards, becoming the first Stanford player to rush for 2,000 in a season. He also set numerous other Stanford records during the season including rushing yards in a single game (243) and all-purpose yards in a game (461). 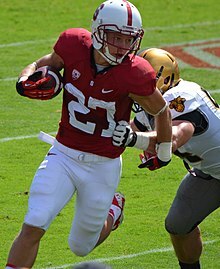 McCaffrey was a consensus All-American and was the Associated Press College Football Player of the Year, Pac-12 Player of the Year, and Paul Hornung Award winner. He also finished second to Alabama's Derrick Henry in the 2015 Heisman Trophy voting. During the 2016 Rose Bowl against Iowa, McCaffrey became the first player to rush for over 100 yards (172) and have over 100 yards receiving (109) in a Rose Bowl game. Overall, he set a new Rose Bowl record with 368 all-purpose yards, breaking the previous record set in 2012 by Wisconsin's Jared Abbrederis. Through the end of the 2016 regular season, McCaffrey led the nation in all purpose yards (211.6 yards per game). He led the Pac-12 in rushing yards (1,603) and ranked fourth in the nation in rushing yards per game (145.7). After being injured during the Cardinal's 42–16 loss to Washington State on October 8, McCaffrey sat out for the team's 17–10 victory in the 2016 edition of the Notre Dame-Stanford rivalry the following week. McCaffrey set a Stanford single-game rushing record with 284 rushing yards against California. McCaffrey was named to the 2016 All-Pac-12 first team and was named the CoSIDA Academic All-American of the Year. After the season, he decided to enter the 2017 NFL Draft. On December 19, McCaffrey announced he would not participate in the team's Sun Bowl game against North Carolina, opting to skip the game to prepare for the NFL Draft. His decision was met with mixed reactions; supporters agreed it was a smart decision, while those opposing considered the move selfish, and potentially detrimental to college football should other players follow suit. Radio host Mike Greenberg, in defense of McCaffrey, said, "Calling Christian McCaffrey a quitter for skipping an exhibition game to prepare for his career is the height of just not getting it." McCaffrey received an invitation to the NFL Combine as one of the top running back prospects entering the draft and completed all of the required combine drills and participated in positional drills. He attended Stanford's Pro Day, but was satisfied with his combine numbers and only ran positional drills for the NFL scouts and representatives. McCaffrey was projected to be a first round pick by the majority of NFL experts and analysts. He was ranked the third best running back in the draft by Sports Illustrated, the fourth best running back by Pro Football Focus, and ranked the second best by NFLDraftScout.com and ESPN. The Carolina Panthers selected McCaffrey in the first round with the eighth overall pick in the 2017 NFL Draft. He was the second running back selected in that year's draft. Only Leonard Fournette went before him with the fourth overall pick. On May 4, 2017, the Carolina Panthers signed McCaffrey to a four-year, $17.2 million contract with the signing bonus of $10.7 million. He made his professional regular season debut in the Carolina Panthers' season-opener against the San Francisco 49ers and recorded 47 rushing yards, 38 receiving yards, and one lost fumble in a 23–3 victory. In Week 3, against the New Orleans Saints, he had nine receptions for 101 yards. In Week 5 against the Detroit Lions, McCaffrey scored his first career touchdown on a six-yard shovel pass from quarterback Cam Newton. In Week 9, against the Atlanta Falcons, he scored his first career rushing touchdown on a four-yard rush in the second quarter. In the team's Monday Night Football win over the Miami Dolphins, McCaffrey scored twice–one rushing and one receiving–and totaled 50 yards. In Week 15, in a victory over the Green Bay Packers, McCaffrey brought his season total to 73 catches and five receiving touchdowns, being the only rookie running back in NFL history with at least 70 receptions and five touchdown catches before being joined by Alvin Kamara later in the season. The following week, against the Tampa Bay Buccaneers, McCaffrey brought his catch total to 75, breaking the Panthers rookie record of 74 set by Kelvin Benjamin. He finished his rookie season with 435 rushing yards, two rushing touchdowns, 80 receptions, 651 receiving yards, and five receiving touchdowns. The Panthers made the playoffs as the #5-seed. In the Wild Card Round against the New Orleans Saints, he had 16 rushing yards, six receptions, 101 receiving yards, and one receiving touchdown in the 31–26 loss. In Week 2, against the Atlanta Falcons, McCaffrey recorded a career-high 14 receptions for 102 receiving yards to go along with 37 rushing yards in the 31–24 loss. In Week 3, against the Cincinnati Bengals, he had 28 carries for a career-high 184 rushing yards in the 31–21 victory. Though limited in yardage for much of the middle of the season, from Weeks 8–10 McCaffrey compiled seven touchdowns in three games (joining DeAngelo Williams in 2008 as the only other Panther with this distinction), including all of Carolina's scores in a 52–21 loss to Pittsburgh. On November 25, 2018, McCaffrey became the first Panther ever to have over 100 yards rushing and receiving in the same game. He had 125 yards rushing and 112 yards receiving in a loss to the Seattle Seahawks. The 237 yards set a Panthers franchise record for most yards from scrimmage in a game. He also was the first player since Arian Foster in 2011 to have 100+ yards and a touchdown both rushing and receiving, and the only player with 10+ receptions in such a game. During Week 15, in a Monday Night Football showdown against the 11–2 Saints, McCaffrey threw a 50-yard touchdown pass on 4th and 2 to Chris Manhertz. With 50 rushing, 50 receiving and 50 passing yards, he joined Walter Payton and Gale Sayers as the only others to achieve this. 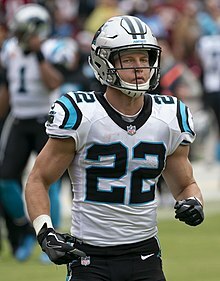 During Week 16 against the Atlanta Falcons, McCaffrey broke Matt Forte's record for most receptions by a running back in a single season, finishing with 101 rushing yards and 77 receiving yards as the Panthers lost 10–24. With the Panthers' eliminated from the playoffs, he had a limited role in the Week 17 victory over the New Orleans Saints with 40 total yards. Overall, he finished the 2018 season with 1,098 rushing yards, seven rushing touchdowns, 107 receptions, 867 receiving yards, and six receiving touchdowns. With the opposite of a Sophomore slump, McCaffrey became the Panthers franchise record holder of all-purpose yards in a season with 1,965. Christian's father, Ed McCaffrey, played college football at Stanford and in the NFL, mostly for the Denver Broncos, from 1991 to 2003. His mother, Lisa Sime, played soccer at Stanford. His older brother Max played football at Duke University and is currently on the San Francisco 49ers as a wide receiver  His younger brother, Dylan, is a quarterback at the University of Michigan. His youngest brother, Luke, is a quarterback at the University of Nebraska. His uncle, Billy McCaffrey, played college basketball at Duke and Vanderbilt University. His maternal grandfather is Dave Sime, an Olympic track star. In 2018, McCaffrey appeared on a new commercial for the NFL along with Jay Ajayi, Todd Gurley, and DeAndre Hopkins. ^ Casey, Ryan (April 27, 2017). "Christian McCaffrey, Valor Christian grad, selected in first round of NFL Draft". CHSAANow.com. Retrieved March 1, 2018. ^ "Christian McCaffrey makes run into record book". The Denver Post. November 9, 2013. ^ "Christian McCaffrey wins 2013 Gatorade Colorado Player of the Year". The Denver Post. December 11, 2013. ^ "Mountain Vista Boulder Running Co. Invitational (First) 2012 – Track & Field Meet". Athletic.net. April 16, 2012. ^ "CHSAA State Track & Field Championships – Track & Field Meet". Athletic.net. May 17, 2013. ^ "Stanford football team will get another McCaffrey". SFGate. February 4, 2014. 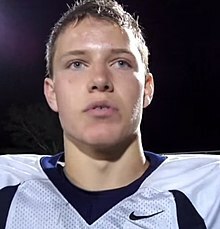 ^ "Christian McCaffrey of Valor Christian commits to Stanford". The Denver Post. May 2, 2013. ^ "California-Davis at Stanford Box Score, August 30, 2014". College Football at Sports-Reference.com. Retrieved March 1, 2018. ^ "McCaffrey had golden touch as true freshman". mercurynews.com. ^ "Stanford looking to Christian McCaffrey for offensive boost". ESPN.com. ^ Fox Sports. "Nobody took Christian McCaffrey seriously & now he can't be stopped". FOX Sports. ^ "Stanford's Christian McCaffrey finally getting the ball". mercurynews.com. ^ "2015 Stanford Cardinal Stats - College Football at Sports-Reference.com". College Football at Sports-Reference.com. ^ "Stanford's McCaffrey sets NCAA yardage mark". ^ "2015 FBS (I-A) College Football Individual Statistics Leaders for Rushing – ESPN". ESPN.com. ^ "McCaffrey breaks Rose Bowl record with 368 yards". ^ "Owusu's catch, McCaffrey's 243 yards highlight Stanford win". ^ Dufresne, Chris (December 1, 2015). "Stanford's Christian McCaffrey runs with a purpose" – via LA Times. ^ "Heisman runner-up McCaffrey is AP top player". ^ "Stanford's Christian McCaffrey named Pac-12 Player of the Year". December 1, 2015. ^ "Stanford's Christian McCaffrey wins Paul Hornung Award". ^ Lombardi, David. "No Heisman, no problem: Christian McCaffrey offers glimpse of what's to come in '16". ESPN. ^ "McCaffrey racks up records in Rose Bowl win". ^ "Christian McCaffrey College Stats". Sports Reference. Retrieved October 6, 2017. ^ Fortuna, Matt (October 15, 2016). "With RB Christian McCaffrey out, Stanford gets by Notre Dame". ESPN.com. Retrieved October 6, 2017. ^ Gilmore, Eric (November 20, 2016). "Christian McCaffrey's 284 yards, 3 TDs carry Stanford to 45–31 win". The Sports Xchange. United Press International. Retrieved October 6, 2017. ^ Lombardi, David (December 7, 2016). "Christian McCaffrey to enter draft". ESPN.com. Retrieved December 7, 2016. ^ Lombardi, David (December 19, 2016). "Christian McCaffrey's Stanford career ends abruptly after surprising decision". ESPN.com. Retrieved December 20, 2016. ^ Goodbread, Chase (December 19, 2016). "Scout: Fournette, McCaffrey made smart decision to sit out bowls". NFL.com. Retrieved December 20, 2016. ^ Auerbach, Nicole (December 20, 2016). "Enough: McCaffrey is a team player, and skipping bowl is right for him". USA Today. Retrieved December 20, 2016. ^ Blackistone, Kevin (December 20, 2016). "Carry counts would have kept Christian McCaffrey and Leonard Fournette available". The Washington Post. Retrieved December 20, 2016. ^ Daugherty, Paul (December 20, 2016). "Doc: Christian McCaffrey's departure selfish". The Cincinnati Enquirer. Retrieved December 20, 2016. ^ Kilgore, Adam (December 20, 2016). "Stanford's Christian McCaffrey ignites debate over stars playing in college football bowl games". Chicago Tribune. Retrieved December 20, 2016. ^ Wetzel, Dan (December 19, 2016). "The dam is about to burst on college players like Christian McCaffrey opting to skip bowl games". Yahoo Sports. Retrieved December 20, 2016. ^ a b O'Mard, Marcus Kwesi (December 19, 2016). "Why Christian McCaffrey Sitting Out Sun Bowl Should Worry College Football Fans". NESN. Retrieved December 20, 2016. ^ Chris Burke (April 24, 2017). "2017 NFL draft rankings: Top prospects by position". si.com. Retrieved May 17, 2017. ^ "Top 32 Prospects for the 2017 NFL Draft". profootballfocus.com. Retrieved May 17, 2017. ^ Jeff Legwold (April 22, 2017). "Ranking 2017 draft's top 100 players". ESPN.com. Retrieved May 17, 2017. ^ "NFL Draft Profile: Christian McCaffrey". NFL.com. Retrieved May 17, 2017. ^ "*Christian McCaffrey, DS #2 RB, Stanford". nfldraftscout.com. Retrieved May 17, 2017. ^ Wesseling, Chris (April 27, 2017). "Panthers select RB Christian McCaffrey with No. 8 pick". NFL.com. ^ "2017 NFL Draft Listing". Pro-Football-Reference.com. Retrieved February 10, 2018. ^ "Draft Finder Query Results". Pro-Football-Reference.com. Retrieved February 10, 2018. ^ Jackson, Lakisha. "Christian McCaffrey signs rookie deal with Panthers". NFL. Retrieved May 4, 2017. ^ Rachel Wold (May 5, 2017). "Report: Christian McCaffrey contract worth $17.2 million, includes $10.7 million signing bonus". yardbarker.com. Retrieved May 17, 2017. ^ "Christian McCaffrey Game-by-Game Stats". ESPN. Retrieved September 24, 2017. ^ "New Orleans Saints at Carolina Panthers – September 24th, 2017". Pro-Football-Reference.com. Retrieved November 5, 2017. ^ "Christian McCaffrey Notches First NFL Touchdown". CBS Sports. November 5, 2017. Retrieved November 6, 2017. ^ "Atlanta Falcons at Carolina Panthers – November 5th, 2017". Pro-Football-Reference.com. Retrieved November 6, 2017. ^ "Christian McCaffrey scores twice as Panthers hammer Dolphins for 3rd straight win". November 14, 2017. ^ "Green Bay Packers at Carolina Panthers – December 17th, 2017". Pro-Football-Reference.com. Retrieved March 1, 2018. ^ "Rookie RBs with 70 Rec and 5 Rec TD". Pro-Football-Reference.com. Retrieved March 1, 2018. ^ "Tampa Bay Buccaneers at Carolina Panthers – December 24th, 2017". Pro-Football-Reference.com. Retrieved March 1, 2018. ^ "Panthers Rookie Receptions". Pro-Football-Reference.com. Retrieved March 1, 2018. ^ "Christian McCaffrey 2017 Game Log". Pro-Football-Reference.com. Retrieved March 1, 2018. ^ "2017 NFL Standings & Team Stats". Pro-Football-Reference.com. Retrieved March 1, 2018. ^ "Wild Card – Carolina Panthers at New Orleans Saints – January 7th, 2018". Pro-Football-Reference.com. Retrieved March 1, 2018. ^ "Panthers' Christian McCaffrey on record-setting pace ... as a receiver". ESPN.com. Retrieved October 4, 2018. ^ "Christian McCaffrey, "makeshift" offensive line impose their will on Bengals". Carolina Panthers. Retrieved October 6, 2018. ^ "Panthers vs. Steelers results". Sporting News. November 9, 2018. ^ "Stats and Notes: McCaffrey sets scrimmage yards record". Carolina Panthers. Retrieved January 24, 2019. ^ "Double 100+ yard / 1 TD games in NFL history". ProFootballReference.com. ^ "Christian McCaffrey throws 50-yard TD pass on 4th Down". Carolina Panthers. Retrieved January 24, 2019. ^ "Christian McCaffrey joins some very rare company with TD pass". Yardbarker. January 23, 2019. Retrieved January 24, 2019. ^ "Christian McCaffrey breaks record set by former-Bear Matt Forte". NBC Sports Chicago. December 23, 2018. Retrieved January 24, 2019. ^ "Carolina Panthers at New Orleans Saints – December 30th, 2018". Pro-Football-Reference.com. Retrieved January 24, 2019. ^ "Christian McCaffrey 2018 Game Log". Pro-Football-Reference.com. Retrieved January 24, 2019. ^ "Luke Kuechly, Christian McCaffrey named All-Pros". www.panthers.com. Retrieved February 4, 2019. ^ Smith, Michael David (September 7, 2018). "NFL suspends Max McCaffrey four games". Pro Football Talk. Retrieved September 19, 2018. ^ McMann, Aaron (May 2, 2018). "QB Dylan McCaffrey feels comfortable in the Michigan offense now". MLive. Retrieved September 19, 2018. ^ Sherman, Mitch (June 5, 2018). "Luke McCaffrey commits to Nebraska Cornhuskers". ESPN.com. Retrieved September 19, 2018. ^ The Morning Call (April 1, 2015). "Central Catholic grad Ed McCaffrey's son Christian developing into talented football player at Stanford – The Morning Call". themorningcall.com. ^ "Stanford tailback Christian McCaffrey is catching on fast". SFGate. ^ Fitzgerald, Tom (October 23, 2015). "Stanford's Christian McCaffrey amassing fans, Heisman buzz". SF Chronicle. Retrieved October 26, 2015. ^ "Watch: Christian McCaffrey stars in new NFL commercial". Panthers Wire. August 27, 2018. Retrieved October 4, 2018.